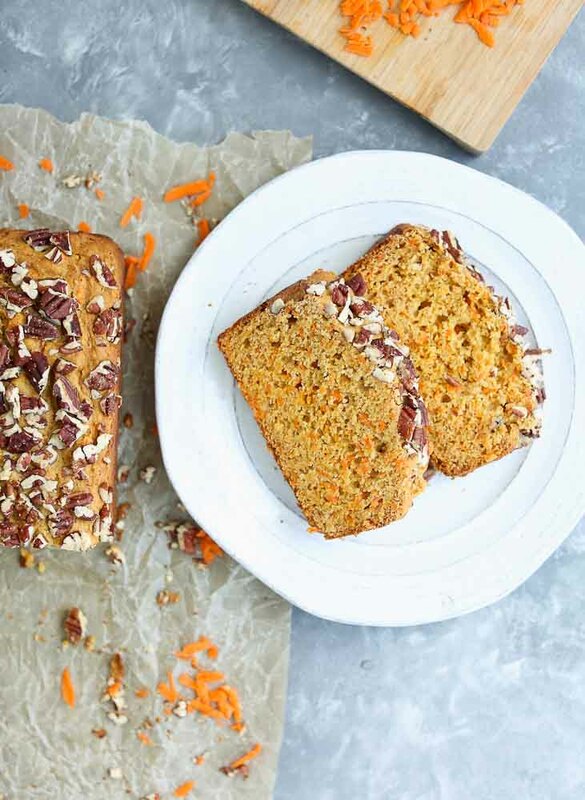 This Carrot Honey Quick Bread has a vibrant color and wonderful texture from the shredded carrots it uses! Let me age myself for a minute. When I got married, my mom gifted me a collection of recipes. It was family recipes, recipes she found in magazines, and recipes she gathered from friends. They lived on note cards and their house was a small photo album. Each recipe was neatly tucked in the plastic pages, some handwritten, others cut from magazines and taped onto the index cards. Clearly this was years before Pinterest was born, and even quite a few years before recipe blogs would take off. This was the old school way to save recipes. 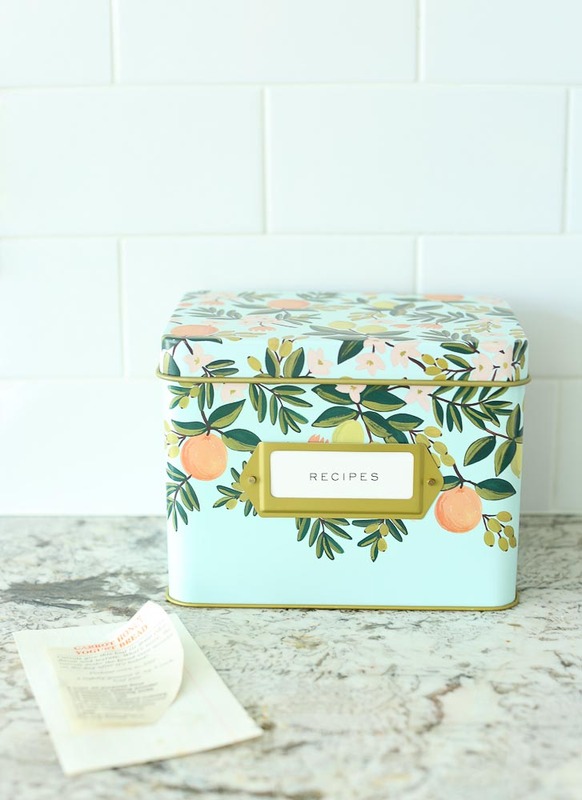 When I was recently shopping at anthropologie, I came across the cutest tin recipe box and I immediately knew that the photo album needed to be replaced. Those curated recipes needed a prettier home. Isn’t it adorable? I could pretty much stock my entire kitchen from anthropologie’s kitchen section. I found the recipe tin here for a tiny bit cheaper if you want to snag one for yourself. 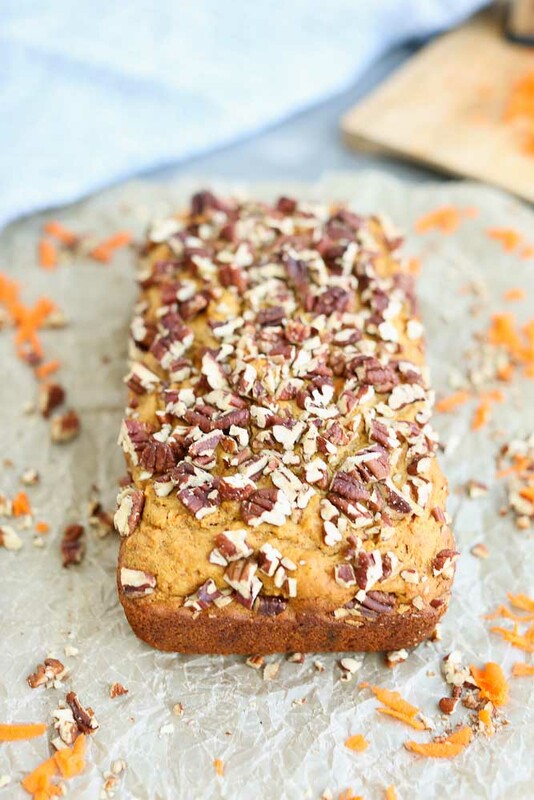 As I was transferring the recipes, I came across a recipe for Carrot Honey Quick Bread. I can’t even tell you the source since it was cut from a unknown magazine. 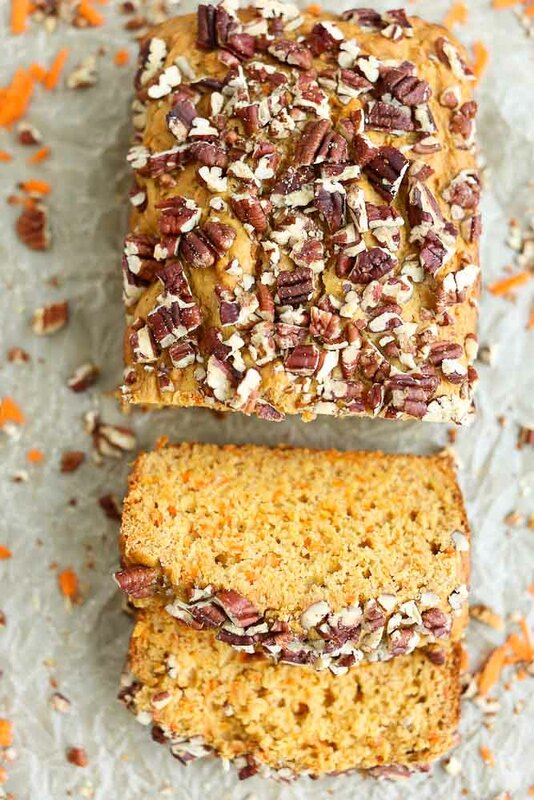 Since it felt right to make a carrot quick bread this time of year, I decided to give it a try. I made a few adjustments to the recipe, using whole wheat pastry flour instead of all purpose flour, adding more spices, and I started out using non-dairy yogurt. While the texture was absolutely perfect, the flavor was bland. It was sweet enough for me, but the kids didn’t like it at all. I made more adjustments and a few trials later, everyone was happy with the results. The kids went from not caring for the first trial to not being able to stop eating the final trial. The texture remained so lovely throughout the trials, and the flavor got better each time I changed things up. I’m not sure exactly what I was thinking baking so many loaves of quick bread the week before we are leaving for spring break. We are heading on a family vacation to Cancun next week and I guess I was so busy with recipe testing I forgot I have to put a bathing suit on. Oh, well. This bread was worth it for sure. By the way, if you want to see some of our adventures, make sure to follow me on Instagram. I’ll be sharing over there. 🙂 The combination of yogurt, shredded carrots, and oil make for an ultra-moist loaf of bread here. (Yeah, I said it.) Seriously, the texture is amazing. It’s sweet and nicely spiced and perfect with your morning coffee or an after-dinner treat. Yum. 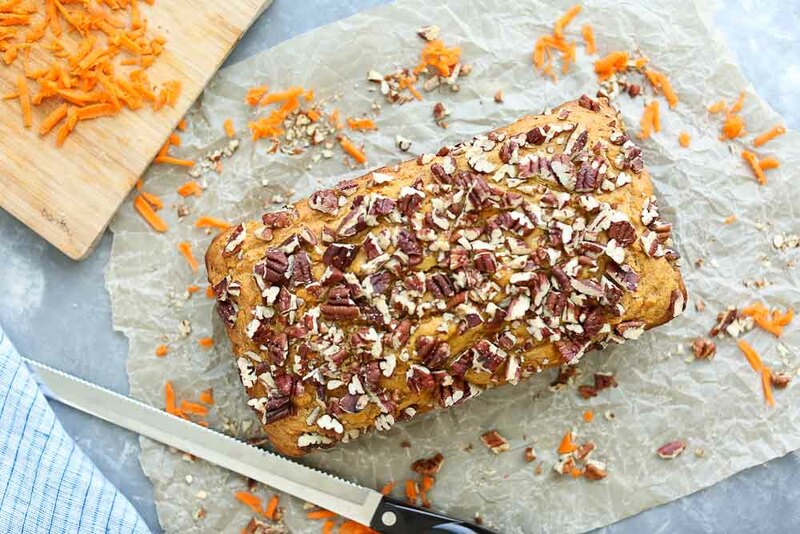 It needed a few tweaks to make it perfect, but I’m glad I came across the recipe for this Carrot Honey Quick Bread. Thanks, Mom. I hope you love this as much as we have! 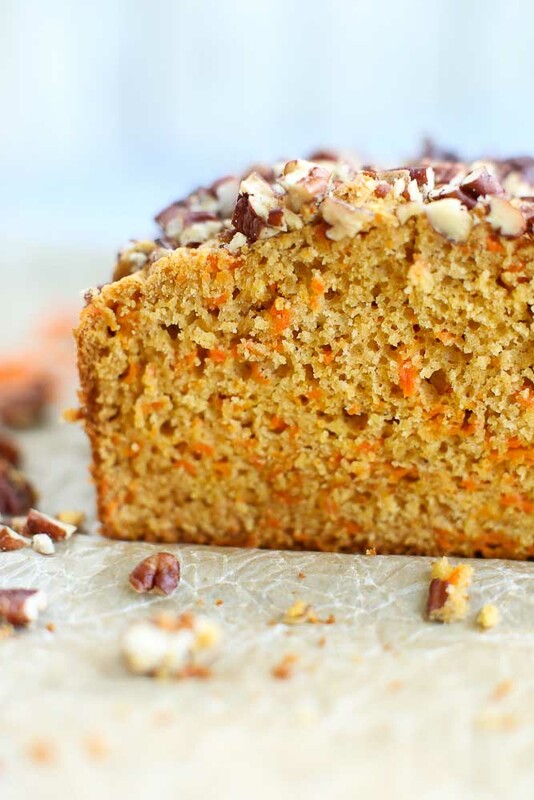 Carrots give this loaf its wonderful color and texture. 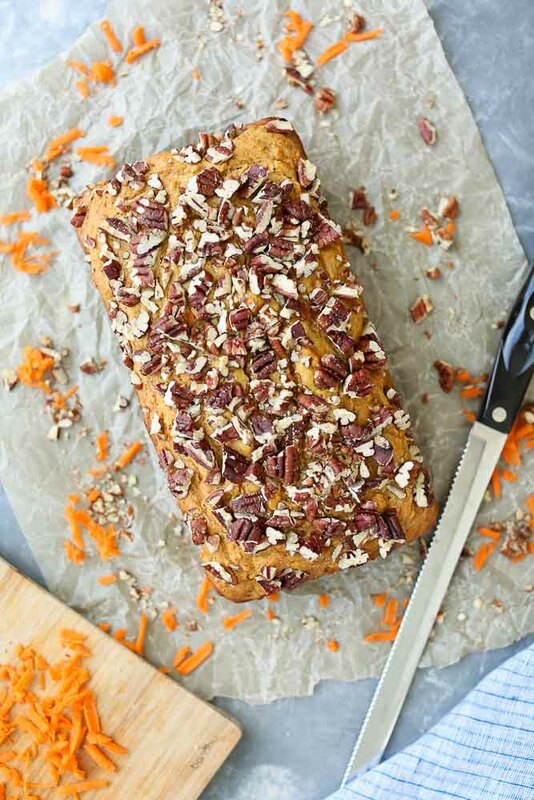 You’ll love this easy quick bread. Preheat the oven to 350 degrees. Lightly grease a 9-by-5 inch loaf pan. In a large bowl, whisk together the flour, Sucanat, baking powder, baking soda, salt, cinnamon, ginger, and nutmeg. In a separate bowl, whisk together the oil, egg, vanilla yogurt, and honey. Stir in the shredded carrots. Add the wet to the dry and mix with a wooden spoon until just combined. Do not overmix. Pour the mixture into your loaf pan and top with the pecans. Bake in the preheated oven until a toothpick inserted comes out clean, about 40 minutes. *Melted coconut oil will probably work in place of the avocado oil if you prefer. Would you like to save this recipe for later? Here’s an image for you to save to your Pinterest recipe board! Links to products in this post are affiliate links. This means if you purchase through my links, at no extra cost to you, I will receive a small percentage of the sale. 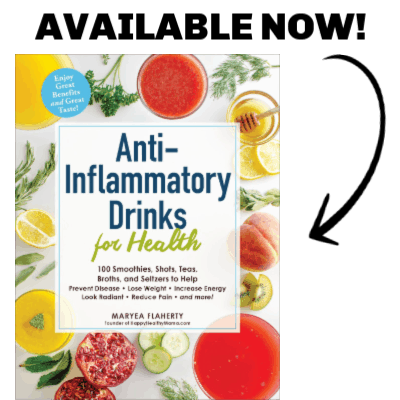 Thank you for supporting my blogging efforts and keeping Happy Healthy Mama up and running! Can you replace the Sucanat with regular sugar? Yes, regular sugar will work just fine!